So your child has finally completed high school! If you’re planning a party for her or him, you have a lot to consider – food, drinks, a cake, a gift, and decorations. One thing you may not have thought about yet is a box to hold the graduation cards that she or he is bound to receive from your guests. This is a tutorial to make a cute, crafty, slightly silly and unique card box for your graduate. When finished, it looks like your grad wearing a mortar board! It’s easy to make and it uses recycled items. 1.) Wrap one sheet of construction paper around the coffee can. Trim any excess and secure the paper around the coffee can with tape. 2.) Cut the other piece of construction paper into a square, to resemble the top of the mortar board. 3.) Secure the square piece of paper over the top of the coffee can with tape. 4.) Make a tassle with yarn in the colors of your grad’s school. Take approximately ten 12″ pieces of yarn, position them next to one another and then fold them in half at the center. Tie another piece of yarn about an inch from the point where they are folded in half. At the point where the are folded, tie one 4″ piece of yarn. 5.) Attach the end of the single strand to the inside of the rectangular hole with tape. 6.) Take a close-up photo of the top of your grad’s head (while she or he is wearing her or his mortar board) with a digital camera. Upload the picture onto your computer and print it out with 8.5 X 11 inch dimensions. 7.) 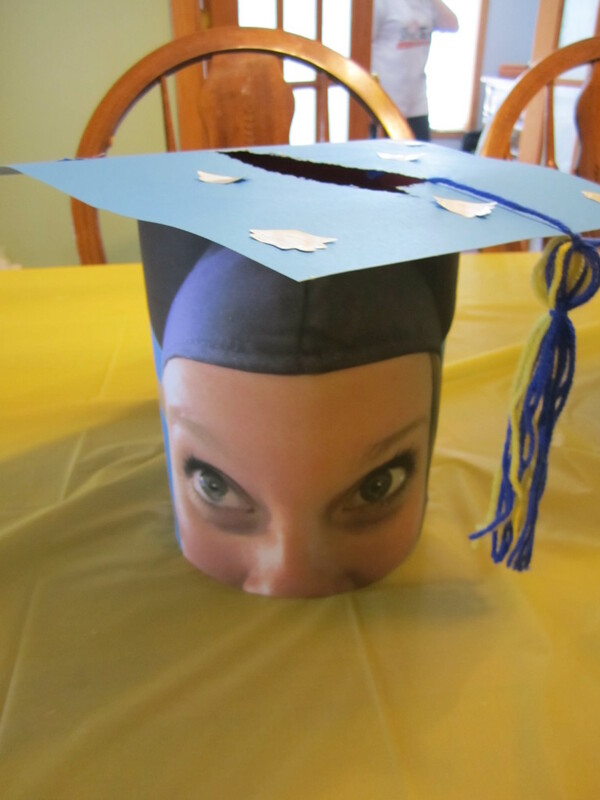 Cut around the edges of your grad’s face on the paper. 8.) Tape the image around the coffee can, with one point on the square piece of construction paper pointing out over the center of the image. We also put stickers on top of the square piece of construction paper (our grad was allowed to decorate her mortar board in real life, so we were trying to replicate this). It turned out really cute! Some of the larger cards were a little bit tough to fit into the can, but with a little wiggling around, all of the cards fit into this can with no problem. Do you know any other graduation day crafts? Share them with us in the comments below!